PRODUCT: MasterSeal 275 (formerly Conipur 275) Waterproofing Top Coat, GRAY Color, INTERIOR Grade (color pigment not UV resistant). 2-Part Fast Curing, 4.78G/Kit. Price/Kit. Special Sale price on an older date code product; Guaranteed Good). Substrates: Concrete, exterior grade plywood. Additional Topcoat Color Options: Charcoal Gray, Black. A TWO component fast curing polyurethane waterproofing TOPCOATING for use over Conipur 265-Z system in indoor and non-UV applications. Very low odor. Suitable for occupied applications. Excellent chemical resistance. Protects against common parking deck chemicals including gasoline, diesel fuel, oil, alcohol, ethylene glycol, de-icing salts, bleach and cleaning agents. Very high solids (99% by weight). 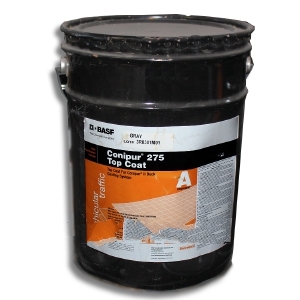 The Conipur 265-Z basecoat is used in conjunction with a conipur 78 Primer and Conipur 265 basecoat.